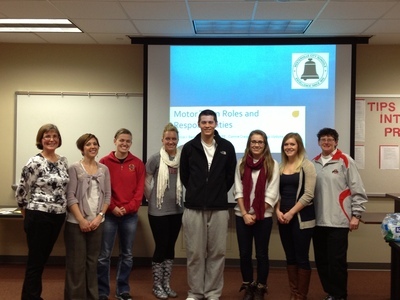 Students in the Health and Fitness Club attended a Motor Team Workshop/Presentation which defined the individual roles and responsibilities of a motor team: Occupational Therapist; Physical Therapist; and Adapted Physical Educator. The three panel presenters Rebecca J. Berkowitz, Ph.D., CAPE (Certified Adapted Physical Educator), Connie Craigmile, PT, Angi Updyke, OTR/L discussed how they collaborate to provide services to a student with an identified disability within a public school and attendees participated in awareness activities. "Allied Health 43" (2013). All Health and Sport Sciences Images. 326.